Amazon Route 53 is a highly reliable Cloud DNS-Web-Service (Domain Name System). 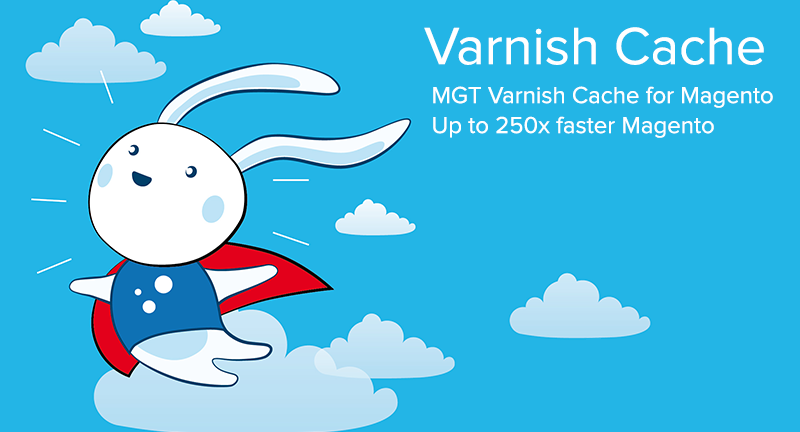 Varnish Cache is a web accelerator, sometimes referred to as an HTTP accelerator or a reverse HTTP proxy, that will significantly improve your Magento shop page loading time. Varnish speeds up your Magento Store by storing a copy of the page in memory the first time a visitor requests a site. We deliver expertise, and professional support derived from more than six years integration experience with Magento. We developed a module to enable easy control of Varnish Cache for Magento, included in our turnkey solutions. Elastic Load Balancing automatically distributes incoming traffic across multiple Web Server instances to different data centers (Availability Zones). The Elastic Load Balancer scales automatically, provides high availbility and highest security industry standards. 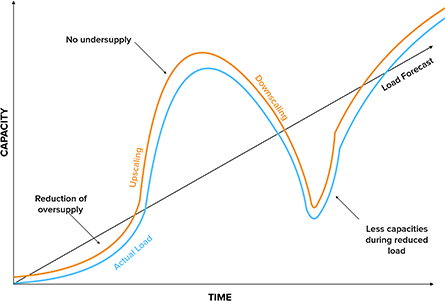 Auto Scaling is used to ensure that the number of instances increases seamlessly during demand spikes to maintain performance and decreases automatically during demand lulls to minimise costs. Amazon Relational Database Service (RDS) is a reliable and scaleable cloud database service. It's designed for highest performance and security. The database service is inexpensive, you pay very low rates and only for the resources you actually consume. Amazon Relational Database Service (RDS) Read Replicas provide enhanced performance and durability. This replication feature makes it easy to scale out beyond the capacity constraints of a single DB Instance for read-heavy database workloads. The NFS Server is used as shared storage between the web servers. All media files including generated product image thumbnails are stored on it. ElastiCache is a highly scalable and fault tolerant web service for in-memory data storage like Redis. Redis is used for sharing the Magento Cache and Session between all Web Servers. The Admin Server is responsible for all backend activities like managing the orders, products, and categories. All Cron Jobs and other scripts are located as well on the admin server. Amazon CloudFront is a web service that gives businesses and web application developers an easy and cost-effective way to distribute content with low latency and fast data transfer. 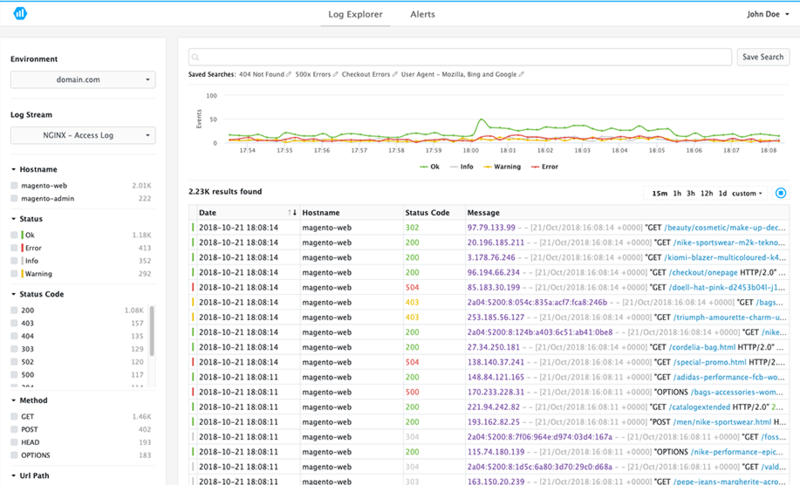 The Test Server is an independent single server environment with MGT CloudPanel. The Test Server is used as pre-production environment to test new features/developments before applying them to production. Sudden CPU workload caused by traffic spikes can be harmful to a Magento shop's performance, and even brief declines in performance happen at the risk of losing customers and revenue. Auto Scaling detects traffic spikes, helps maintain application availability and allows automatic up and down scaling of web servers to individually defined conditions. This way, we can ensure to host your Magento on just the right amount of web servers at all times. Due to dynamic scaling of web servers based on incoming traffic, Auto Scaling can lead to up to 70% cost reduction compared to static architectures. 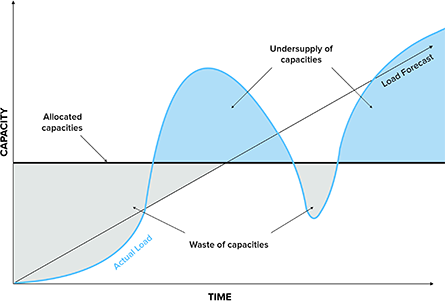 Static architectures are based on estimated load expectancy and are not flexible enough to adapt to unexpected load peaks or lulls. Auto Scaling is the most cost-efficient solution for a fluctuating load. High performance and thereby user satisfaction are retained at all times. AWS prices displayed in this example are a rough estimation, meant to give orientation. As every shop is developed individually, AWS costs will be different in each case. We highly prioritise security in all of our processes to deliver comprehensive protection and compliance to our customers. Using the largest cloud infrastructure in the world comes with the high standard of global security and compliance. Additionally, we strengthen cloud security with our security measures on top of AWS's high requirements, allowing businesses to scale and innovate, while maintaining a safe and secure environment. Only selected team members have access to the AWS Management Console, controlled via two-factor authentication. We use encrypted password databases, which are also only accessible to selected highly qualified individuals. Availability is of highest importance for e-commerce in the cloud. AWS customers profit from AWS services and technologies, designed from scratch to offer the best resistance against DDoS attacks. We use a combination of AWS services to effectively avoid DDoS attacks, including Amazon Shield, which incorporates always-on detection and automatic inline mitigations to minimise application downtime and latency. AWS WAF is a web application firewall that helps protect your web applications from common web exploits that could affect application availability, compromise security, or consume excessive resources. We use AWS WAF to create custom rules that block common attack patterns, such as SQL injection or cross-site scripting. 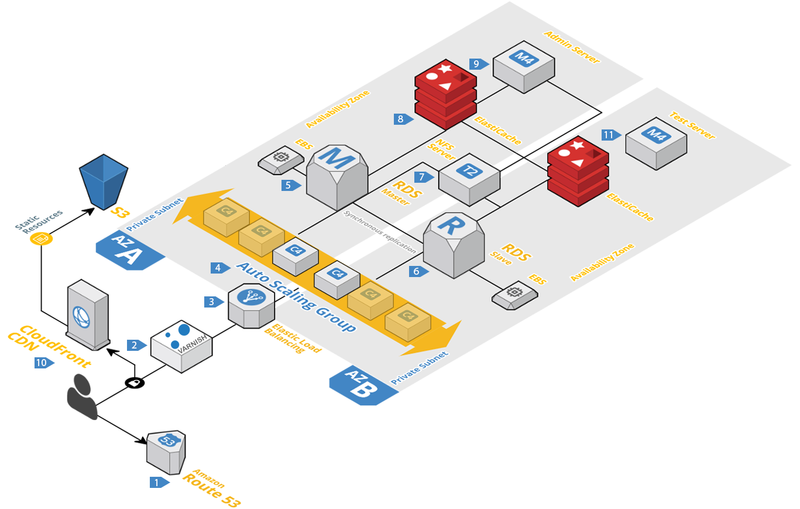 The AWS WAF is beeing attached to the Elastic Load Balancer (ELB). With the AWS Port Firewall, we control the traffic to your instance, including the kind of traffic that can reach it. Amongst other features, IPs can be defined to access an instance using SSH or they can be used for remote database management. We use industry standard protocols to encrypt network communications as well as to establish the identity of websites on the internet. You will benefit from encryption for sensitive data in transit and authentication using SSL/TLS certificates to establish your site's identity and secure connections between browsers and your Magento shop. We have just the right Service Level for your individual needs. The experience gathered in years of providing Magento Hosting to clients of all sizes has taught us that no Magento shop is the same and every customer has different requirements. Check out a detailed comparison of the service levels below. Q: When does it scale up? When the CPU utilisation of all web servers in an Auto Scaling group reaches a particular threshold for a period, an upscaling event is triggered. (Such a pre-defined threshold could be, for example, 60% or more utilisation for over one minute.) Depending on the instance type, we add one to four more web servers to have enough capacity for traffic spikes. Scaling conditions are configurable and can be individually defined as desired. Q: When does it scale down? Likewise, downscaling is initiated when the CPU utilisation of all web servers is below a particular threshold (for example, less than 20% for 15 minutes). For downscaling, we remove one web server at a time to make sure to save enough capacity for another traffic peak. Q: How long does it take to have new web servers running? Scaling up new web servers takes about 1 to 2 minutes. The boot process of an instance takes about 45 to 60 seconds. Afterwards, we synchronise the code, right before the Elastic Load Balancer starts health checks and finally brings the new web server(s) into service. Q: Is it possible to have only one web server as a minimum? Yes, it's possible. In the unlikely event of the web server getting impaired, it will be automatically replaced by a new one, either in the same or another data center. Q: How does the code deployment work in an auto scaling environment? Deploying code in an Auto Scaling environment isn't trivial. To make code deployment faster and more effective for our customers, we developed MGT Code Deploy, which is included in all Auto Scaling plans.